Ah! I am so excited to be writing about this! Huge thank you for everyone who participated, I absolutely love all these products and have most of them myself. So here is a breakdown. In the usual fashion of a busy mom, I waited till about 3 weeks before Lexi’s birthday to think about what we were going to do. The plan from the previous year was to simply celebrate her birthday at Disney, since the crowds are super low at that time and that would mean that I wouldn’t have to kill myself planning another party. Disney was instantly forgotten, while a flurry of ideas were swirling in my head. I have to roll my eyes at this one, because I get so enthusiastic and excited about things and it’s hard to stop me, and then I get myself into something that I certainly can’t pull off or don’t have time to. And in the end, amazing memories are created even if there don’t end up as perfect as I envisioned them in my head. As soon as I saw the Swan dresses I said to myself: “Swan theme! This has to be it!” And then we got carried away. The problem was at that point there was 2 weeks left to plan things. That’s not enough. 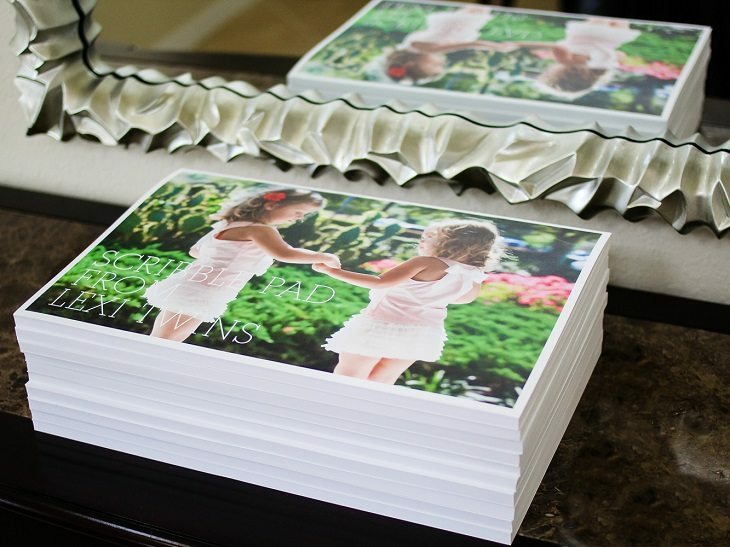 Since we didn’t have time to take pictures before ordering invitations, we had to go with a pre-made design from Paper Culture, my favorite card website. 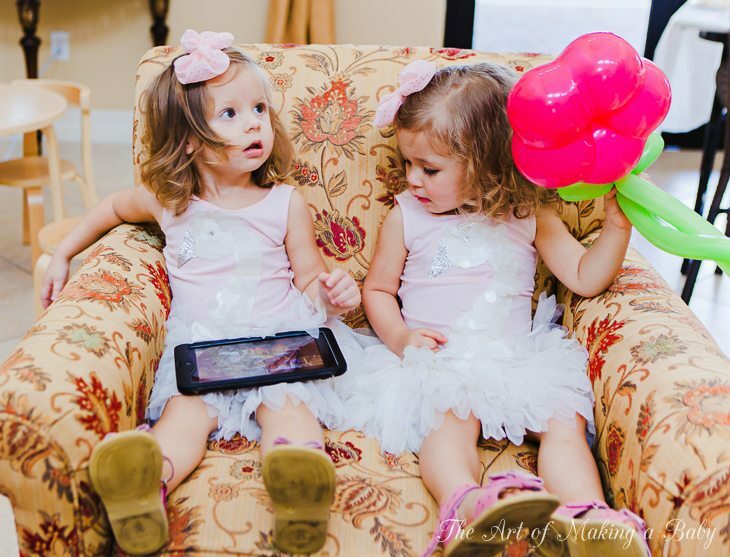 It just so happened that they had a perfect design of twin ballerinas ( amazing, right?). So we ordered a cake from a local European bakery, we got some decorations, applied to have our clubhouse rented out, we hired an entertainer and a photographer (my friend Leeka, who came down specially to photograph the occasion). Kristy set off on an ambitious task of making a few things for the party, and I was working with companies to put together the favor bag of all favor bags. The biggest challenge was that we weren’t allowed to prepare the clubhouse until after 9pm the day before the party. The party was set to start at 11 am. Kristy lives 40 minutes away from us. So it was almost impossible to get anything prepared before hand. That is one mistake I will not make again. All parties are to be held at our house, or don’t bother with the decorations. Having 2 hours in the morning to put up decorations and make the food for the party was not realistic as we later found out. But, oh well, lessons learned. So the decor was really basic, but not for the lack of work that went into it. The morning of the party and even some time into the party was spent preparing tea sandwiches, same ones that we served at the first birthday party and were such a hit. With little time to prepare everything, we literally were barely able to keep stocking and making the sandwiches before they were cleared out by guests. I guess that’s a good thing, too. The marshmallow pops were made by Kristy and were a huge hit, too, as well as dipped pretzel sticks. 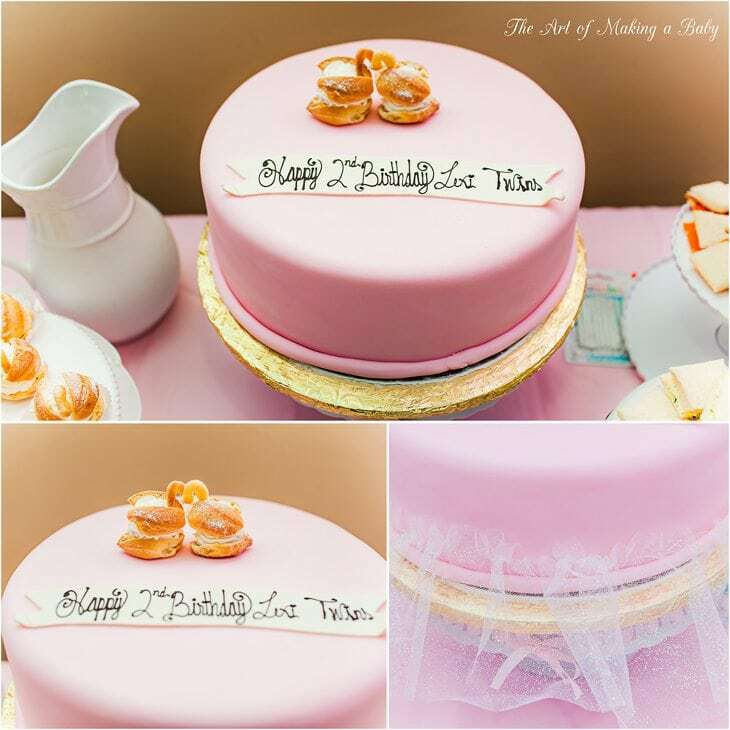 We made sure our cake was simple so that we could put a tulle tutu one it and two swans pastries on top. The standout photographs on the table are from Mpix. A great way to decorate a party table or a mantle. They were perfect and one of the few decor pieces I actually enjoyed. 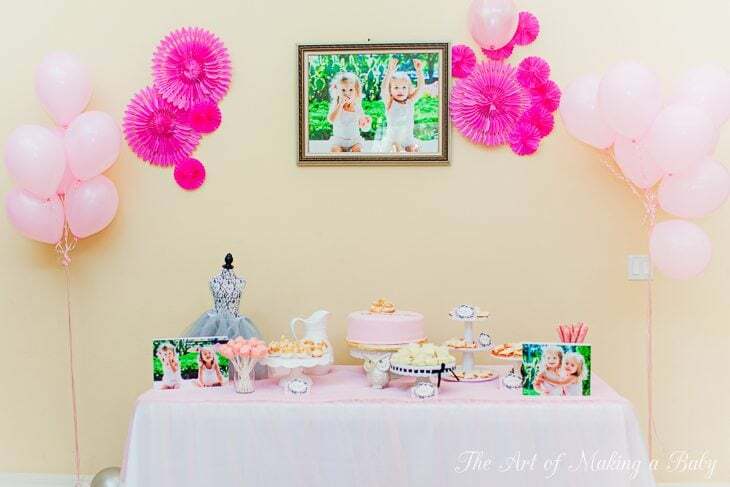 I am so glad we had a little swan outfit photoshoot before the party and were able to place these photographs into the party. Party hats above were made by Kristy, as well, they are super cute, aren’t they? So we set up a few tables with white table clothes and roses on each tables and pink plates, and hung a silver curtain on the wall for pictures. I brought a bunch of toys from the house, like the Svan Table, Bobles and a Pacific Play Tents house. There were about 11 kids plus parents, so it was a pretty fun busy party. So onto the part that did work out great..
Super cute and well-fitting dresses for girls that can be purchased with co-coordinating (not matching) dresses for moms. I love that concept and love the girls’ dresses they sent. Mommy’s dresses aren’t a complete match but healthy similarly designed clothing that a woman would want to wear. Not that I am against going all matchy-matchy, anyways. 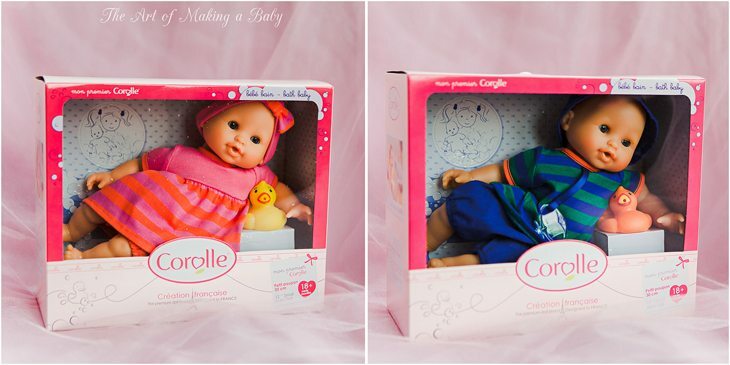 The ultimate in baby dolls. All guests received a Corolle doll. There were these gorgeous huge dolls for 3+, mademoiselle Corolle, and smaller cute baby bath dolls for the under 3 crowds, boy and girl. MAM was very cool and sent a ton of stuff to the guests at the party. 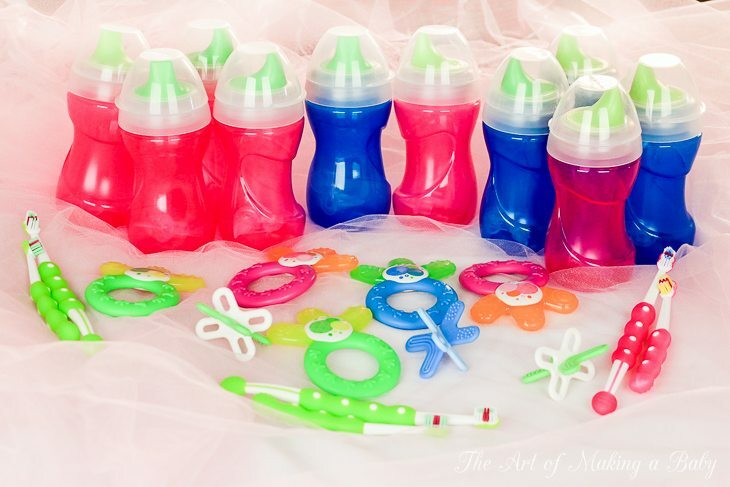 We had sippy cups, teethers (my all time favorite, btw), toothbrushes (Lexi’s first toothbrush). 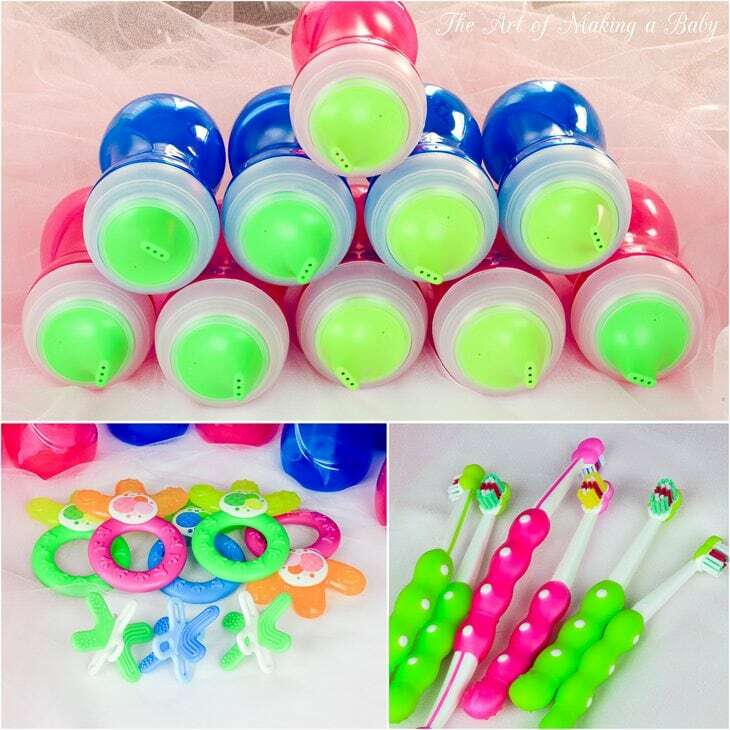 These teethers were a lifesaver for us, especially the ones for molars and those you can freeze. You can follow them on Twitter or Facebook for a chance to win some goodies. You know our favorite pjs, right? Skylar Luna. 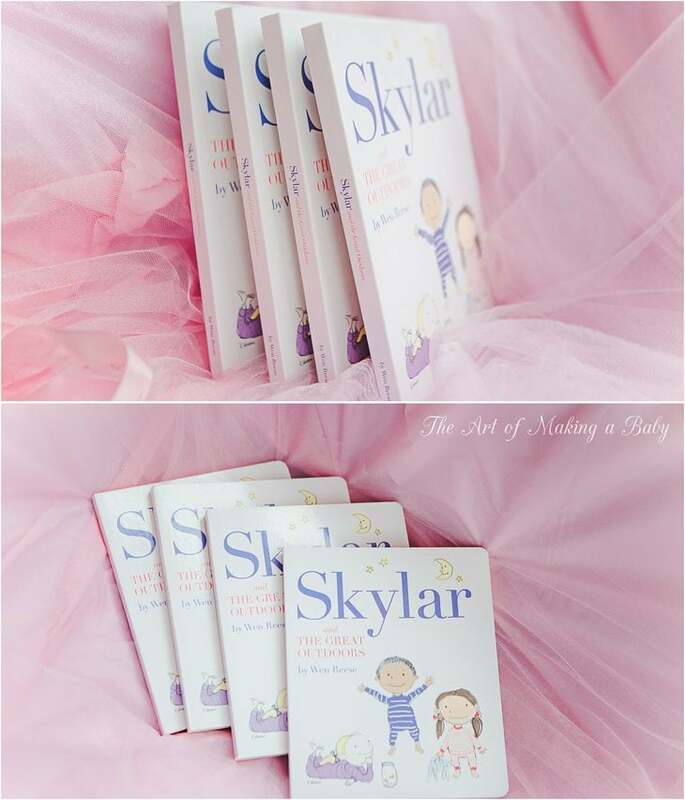 Well, they came out with a book featuring Skylar, who goes on an adventure with his friends, with all his friends wearing SL pajamas. 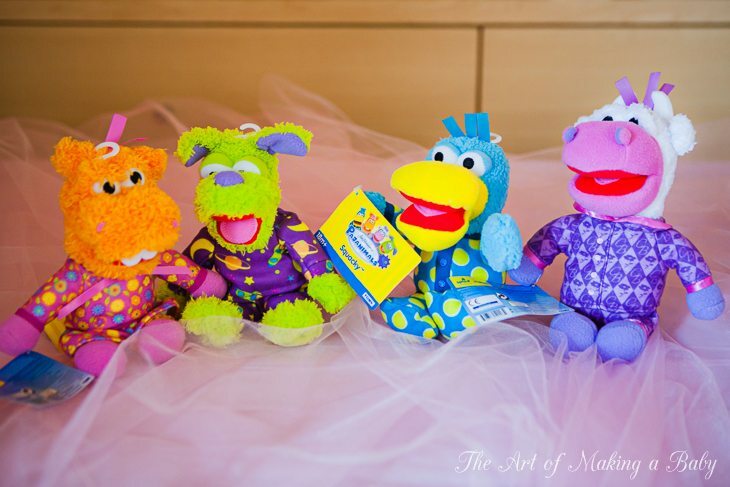 Super fun way of incorporating kids’ favorite PJs into nightly storytime. Again this brand isn’t new to my blog. I adore their swimwear designs, and you will see some of their swim in my future posts . They sent some super cute one-pieces and bikinis for all the girls. Submarine swimwear is definitely a unique designer brand worth seeing. I swear if another person wonders what smells so good when in vicinity of Be Delectable and I have to tell them about the brand, I’ll buy stock in the company. BeDelectable is a new brand of non-toxic skin care products that smell UNREAL! I am not joking that I hear “Mmmmmmm what smells so good?” every time I spray it on myself or use the cream. I always hated putting good smelling creams or fragrances on, because I knew that there were full of nasties like parabens and pthalates. This collection is free of parabens, phthalates, GMOs, mineral oil and petrolatum, among other things. 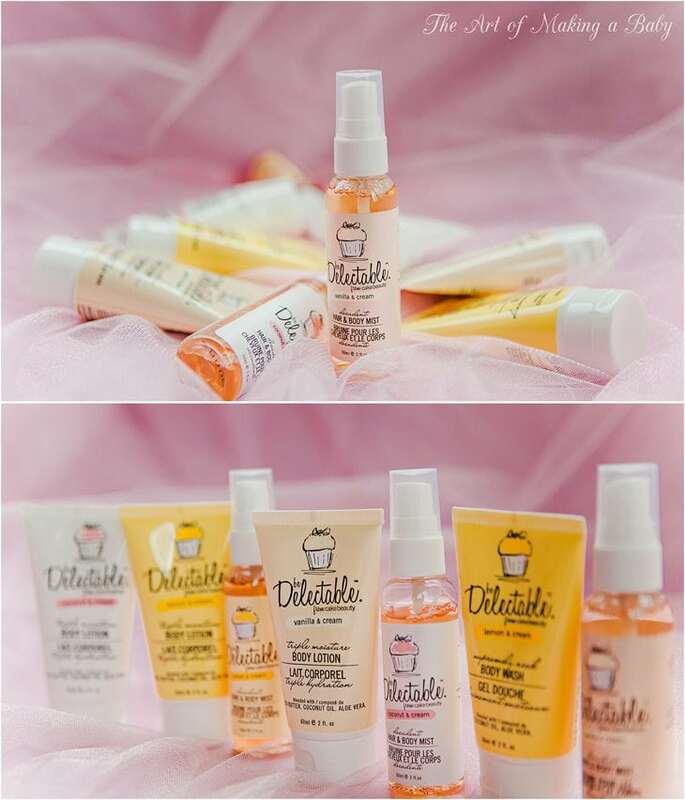 So Be Delectable sent a gift set of their awesome flavors like coconut vanilla or lemon cream for each of our mommy guests. Ah, my love! 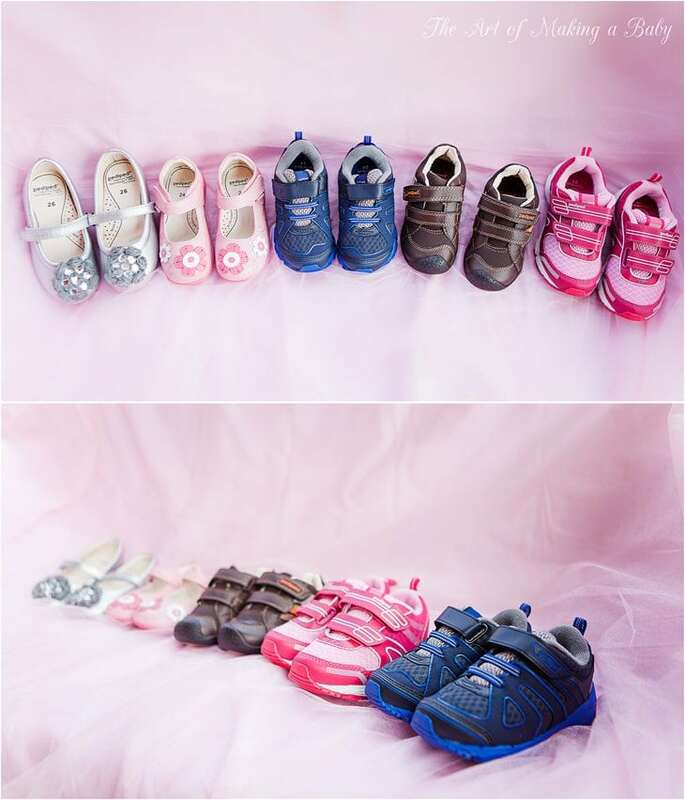 I fell in love with Pediped shoes before Lexi was walking and we are still dedicated fans of the brand. Best fitting shoes! By far! The only brand that we’ve tried that doesn’t rub, create blisters and hurt – and we wear them WITHOUT socks, since we are in Florida. All the guests got a different pairs of shoes, all equally cute and I bet they are currently discovering how comfortable they are! Look at all the colors! They make me happy! So I haven’t’ written about Tegu here yet, but they are my new favorite toy! Magnetic blocks that can be put into virtually any position with imagination being the only limitation to what one can build. These are seriously good! 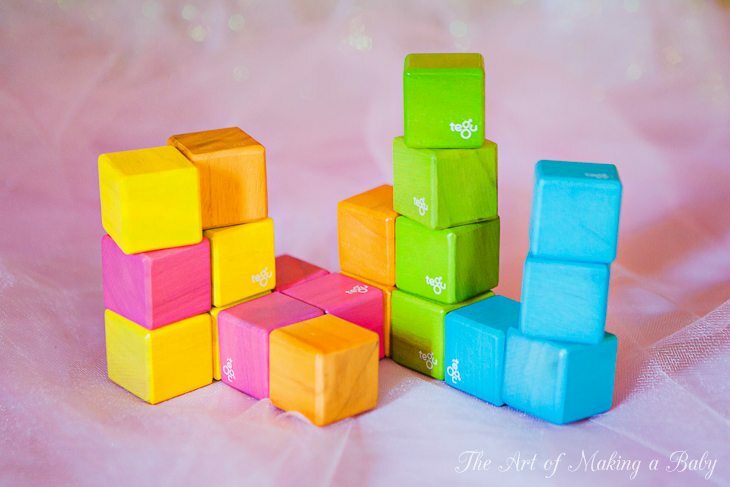 We could only include a square block set into the bags, but Tegu has all kinds of shapes and colors when it comes to their blocks, so anyone can create virtually anything. And when I say anyone, I mean adults too, because it’s such a universal toy. Well, I don’t have to say much about Boon, do I? Everyone knows how awesome their whole line of products is, right? These snack cups in the new 2014 colors (which I looooooove, btw) were a useful and coloful addition to the bags. I know mommies will love having a nice snack cup for their toddlers. 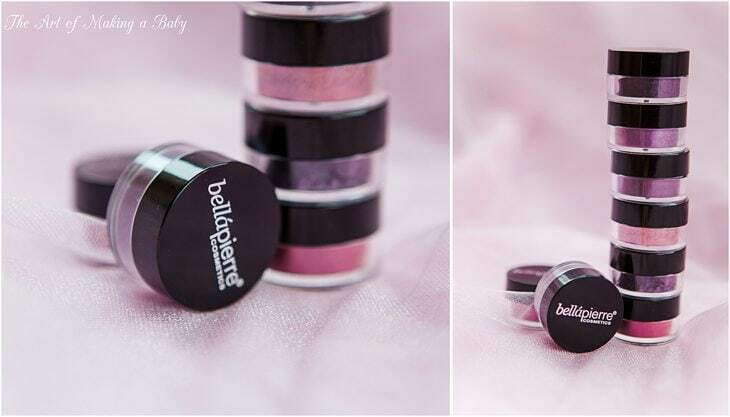 A completely new company to me that I am yet to explore, Bella Pierre is a mineral make up shop. 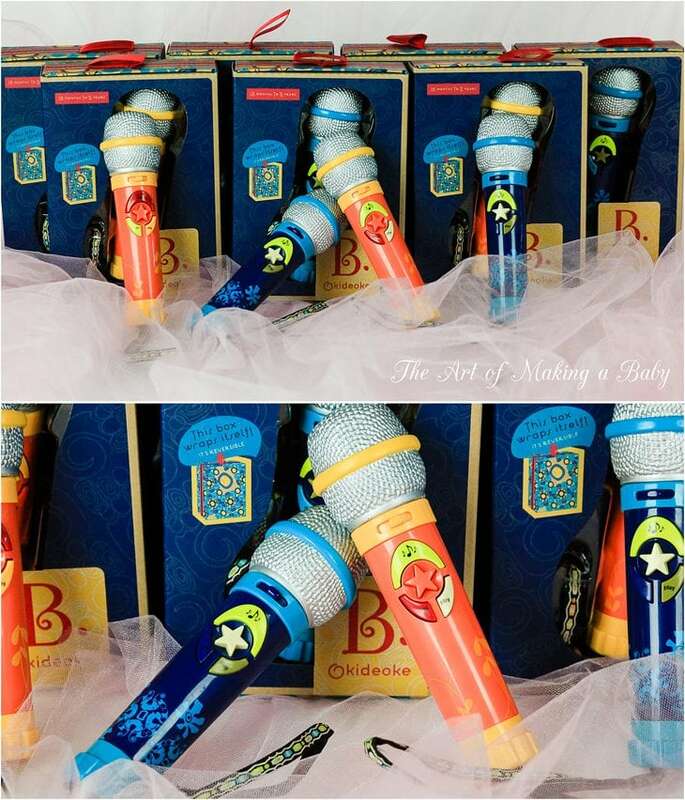 I have not tried their make-up myself yet, but according to reviews it’s pretty nice, so it was a fun items to throw into the bags that moms would enjoy. 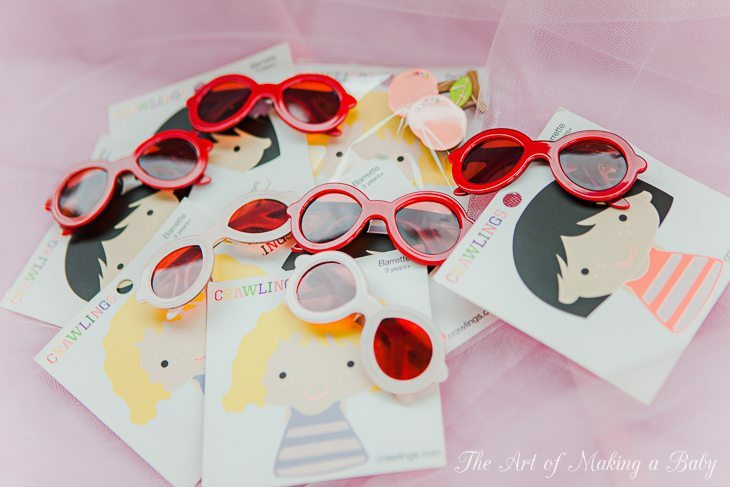 Glasses hair clips! I didn’t know back then that Lexi would be wearing glasses, but how cute are these little glasses barettes? Adelaide has cute Mommy and Me options, as well as my favorite Russian nesting dolls. Great alternatives to bows for little girls. Oh we had such great plans with Pinhole Press! But we got majorly (excuse my language) screwed by the winter storms up north and the shipment got delayed. The plan was to have these AMAZING scribble pads on the tables, with some crayons for kids to draw with and then put together all the drawings from that day as a memory of the birthday party. The guests would then take the pads home. 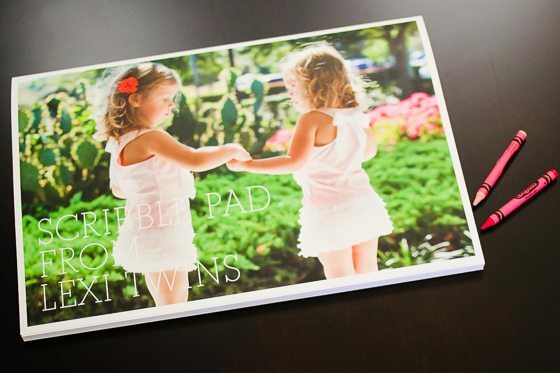 These pads themselves are impressive: thick thick paper, detachable for easy hanging, photo on the front and a thick pad on the back. You can see how huge each scribble pad is. 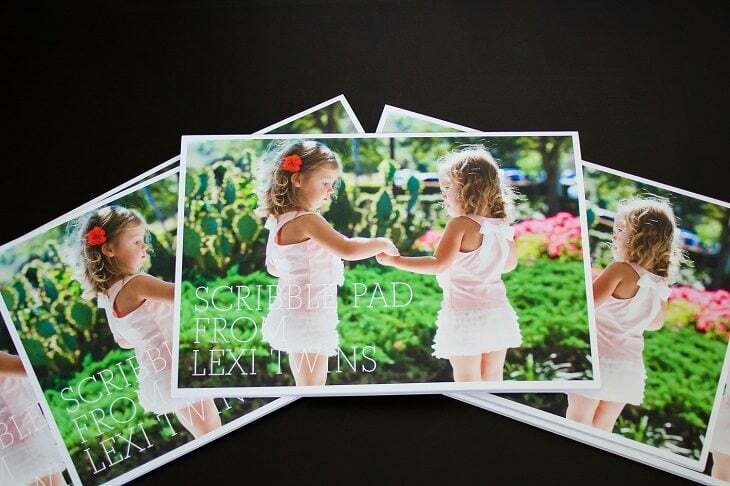 I was honestly blown away by the quality, like I have been with anything Pinhole Press has ever produced. 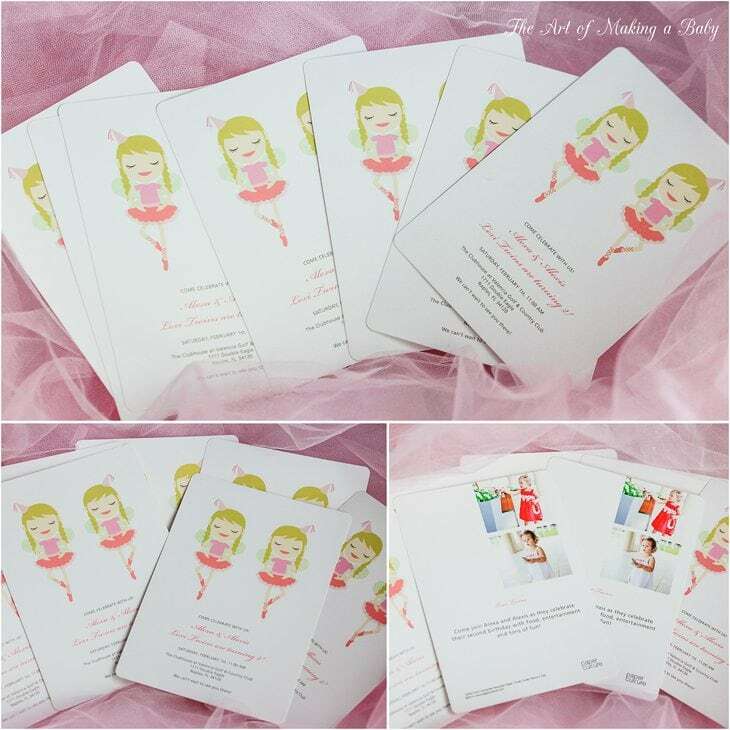 Aside from the pads we were also sent an assortment of personalized party supplies, like bottle covers (for water bottles or lemonade bottles on the tables) and photo wall decals (a perfect alternative to a photobooth I did last year) and gift bag tags. All of which we couldn’t use due to the late delivery. 🙁 Sad, but at least I’ll know how amazing these items are for the future and will get to order them again next time. And I think the decos look great! What didn’t you like about them?! 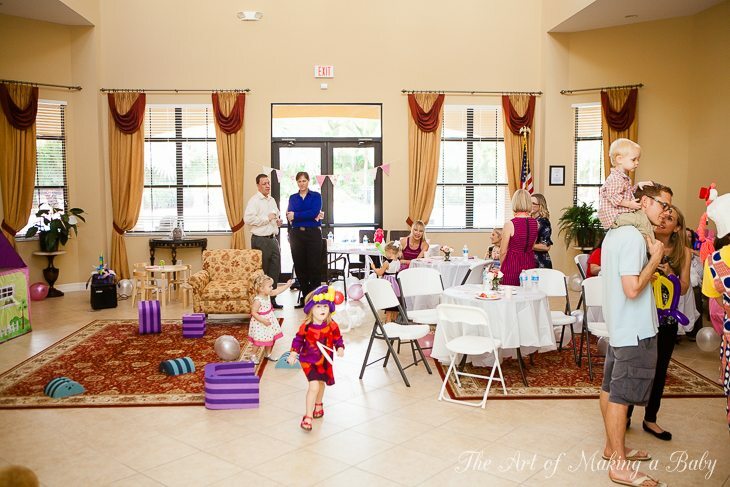 Do NOT ever feel mommy guilt for not throwing a party for a two year old! Come on! That’s just silly! They don’t understand much at that age when it comes to party. You are really throwing a party because YOU like the idea, not because your toddler needs one 🙂 So stop that! 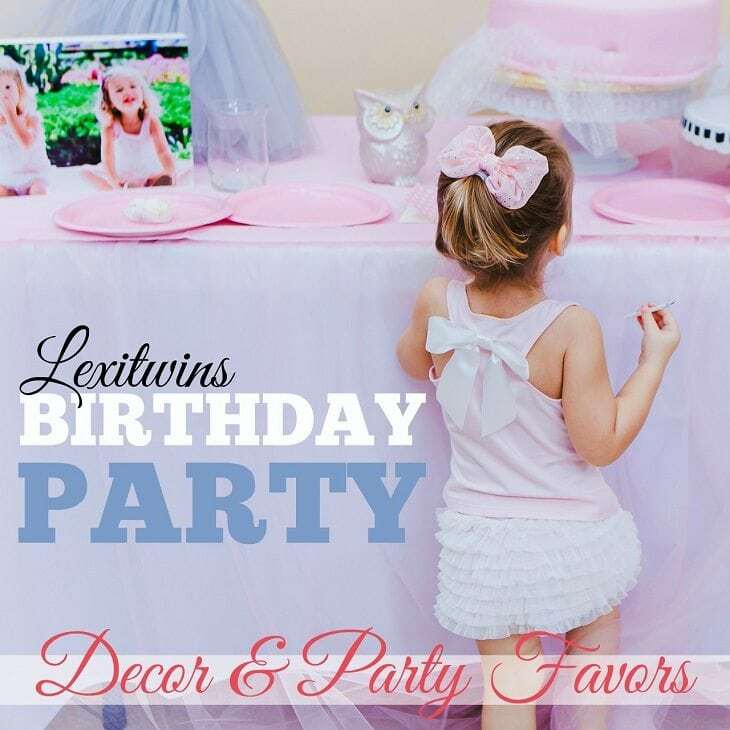 It was fun and Lexi was super excited about the party, but then it was done and forgotten 🙂 Speaking of which, I should create a little movie for her so that she could remember it and possibly retain the memories longer. What a great looking party for 2 bffs! And so awesome that your guests received those incredible favor bags. 🙂 Excited to read the next birthday post! I like the little owl on the table. Very cute! I’m surprised at the amount of stuff that you gave as party favors. That is very generous of you. Is that the typical amount of swag given to Lexi’s friends at other parties that you’ve been to? Oh gosh, no! The party bag was this huge ONLY because I have the opportunity to work with companies to send these items to my guests. 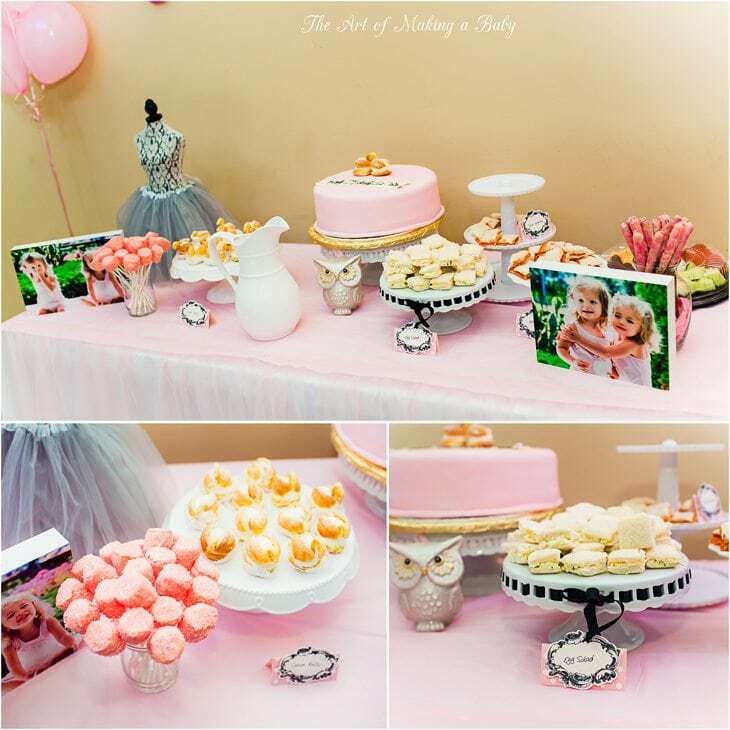 It was a fun thing to put together, and it didn’t cost me anything AND my guests enjoyed. Of course, something like this isn’t traditionally done. Looks like a fun, basic party for two cute two-year-olds! I love how you pick original themes that not every other parent of a toddler might pick. Most two-year-olds wouldn’t even care about Swan Lake, but the girls looks so darling in those matching dresses! The hardest part of party planning for me is always coming up with fun activities for the kids. Your goodies bags were AWESOME and I can’t imagine how much all of the kids (and parents) loved them, but what kinds of activities did you have for the kids to do? Were they swan-themed? 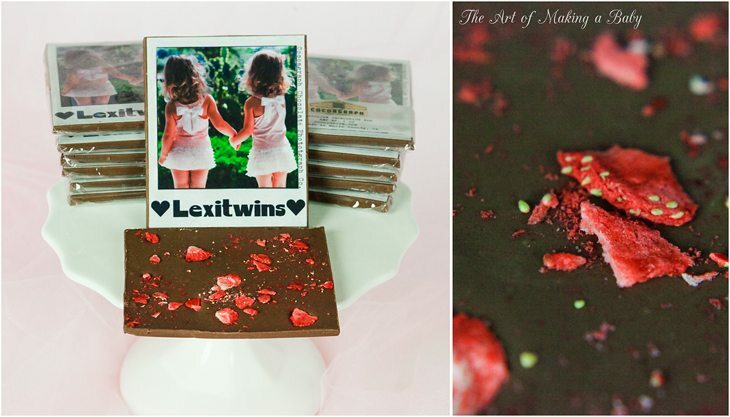 Ok I have to say it, at first glance, the first picture looks like Lexi has a French cigarette in her hand! LOL! 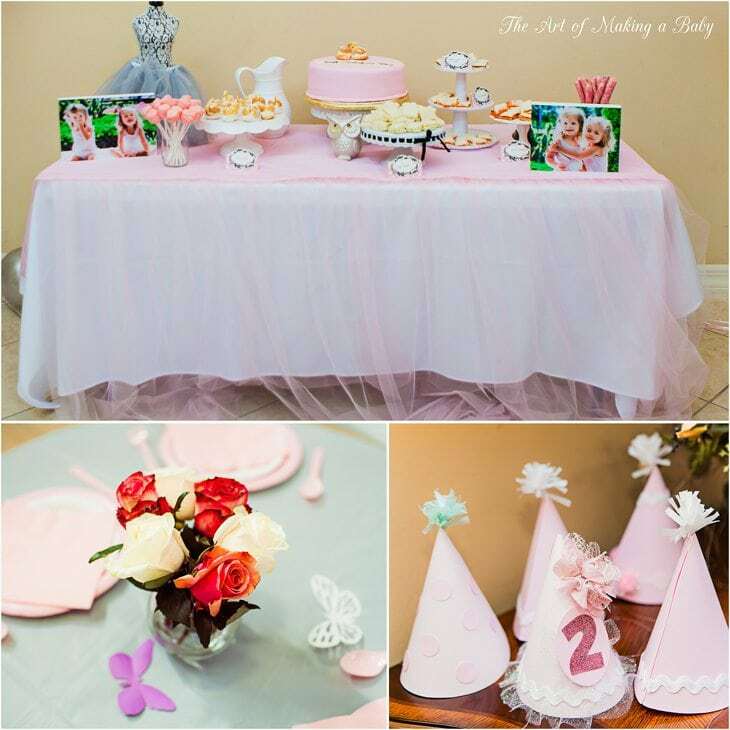 But anyways: Adorable party details!! If only I had sponsors, oh the things I could come up with. Lol. Good for you. Someone earlier was asking about that tent. I thought you said it had flame retardant spray on it? And you got rid of it? Or is that a new one? I’ve been looking for a nontoxic one, with no luck. I had to go back to see that- Lol you’re right! Re: tent, no, we don’t use it anymore once I found out for a fact that it has FRs. Haba is the only brand I know of that has never sprayed their items with BFRs. Love the swan outfits. Such fun memories for both Lexis! Ah! Where were you when I was planning it? That would have been an AWESOME idea! Dang! Oh well, I will have to remember for next time! PS Can’t believe you planned this in such a short time! And just generally impressed with how you balance AP, Daily Mom, blog, fitness, etc. I had help from Kristy! That was a huge part of it. I doubt I’d be able to manage it otherwise. And I have an amazing team of girls on Daily Mom that help me there in times when I need to step back for a few days! Oh and , ahem- there is no real fitness happening here right now. hahaha. I am trying to get back to it, but um… there are just not enough hours and energy in a day. Everything looks great especially considering you only had 2-3 weeks to get it all organized. It’s amazing what we can accomplish when we put our minds to it! Your guests, big and small, are so fortunate to be gifted those favor bags! I’d be so excited for C to have any ONE of those items! Amazing!! The clubhouse wouldn’t even tolerate simple scotch tape to hang decorations on the walls? Seems silly to me. Does Kristy have anywhere close to where she lives that would be suitable for a kid’s birthday party? We were going to host it at Kristy’s clubhouse, because personally I like it slightly better and the rules are less strict, but it was booked on that day 🙁 Then we also explored a hotel ballroom, but it’s high season during their birthdays so also no luck there. You’re right, in a way. But a two year old birthday is not the right occasion for that. I’ve had ideas about putting together a lot of things and events, but unfortunately I just do not have time for something that is of that scale. I give away things we don’t use to families in need that we know all the time, but organizing something like what you’re suggesting would simply take more time than I have. a lot of charities let you set up a fund in lieu of receiving gifts. we did that for our wedding and i think will do it for my daughter’s next birthday. she has enough stuff… it’s fairly easy to do and takes 5 minutes. Now that’s a good idea. Last year I just said no gifts, but I wish I thought of that option, instead of gifts. I love this idea! Did your guests actually donate to charity Mel? And did they really forego a gift at your wedding? When my dad passed, we asked for a donation to the cancer charities in lieu of flowers. However, most funeral attendees still gave cash gifts (totalling thousands of dollars), even if they also donated to the charity. My mom did donate it all afterwards. I find that human nature tends to want to give a gift (even when you ask them not to)! i actually love irina’s idea. need to figure out an occasion for that. speaking for myself and my mom friends – we all have boxes of outgrown clothes in our basements and need motivation to sort through them and donate them. Wowww that is the craziest but coolest favor bag I’ve ever seen! 😀 I’m currently in the process of prepping for my daughter’s 1st bday and starting to get a liiiiil nervous, but in the end I know it’ll be ok because it doesn’t need to be perfect! Beautiful recap, by the way. It is a pretty crazy bag but it was fun putting it together. Next time it will add one for a giveaway.